Chamomile and Vervain are both digestive bitters that have a relaxing effect on the nervous system. 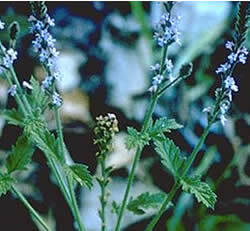 Vervain is the more bitter of the two, so free free to adjust the amounts to suit your palate. Great tea blend for nights when an uneasy stomach is keeping you from relaxing into sleep. Recipe Instructions: Herbal Tea :Use one teaspoon of herbal mixture to each cup of hot water. Infuse for 5 minutes and drink warm before retiring.